Monday, October 6th, marked the end of my six years service as a member of the City of Idaho Falls Parks & Recreation Commission. My term ends December 31, 2104. However, we will be in Arizona for the November and December monthly meetings of the Commission. My first three-year term was a lot of fun. The second term? Not so much. I am very, very happy, relieved and pleased to be leaving the P&R Commission. So what did we accomplish during the past six years of volunteer service on this Commission? Well, it's a glass half full, half empty kind of thing. You could make a case we got a lot done and you could also make a case we didn't do much at all. Being the optimistic sort, we'll take the glass half full, thank you. 5. Catalyzing a new Mission Statement for the Parks & Recreation Division. Oh, the fun February day we spent visualizing sites under the snow where the art benches would go. There will never be any doubt that we played a pivotal role in helping the group effort to get the Greenbelt Art Benches up and running. It's really far too long a story to tell here but it is a story that brings a special glow to our Heart & Spirit. We will always be grateful for the way fate conspired to put us in the position to make a genuine difference in this awesome, historic legacy for the Greenbelt. One of the biggest benefits of our participation in this group effort was getting to know Carry G.S. She recently named us in a statewide article published about the Greenbelt Art Benches. Here is the blog we used back in the day that really helped "the cause." 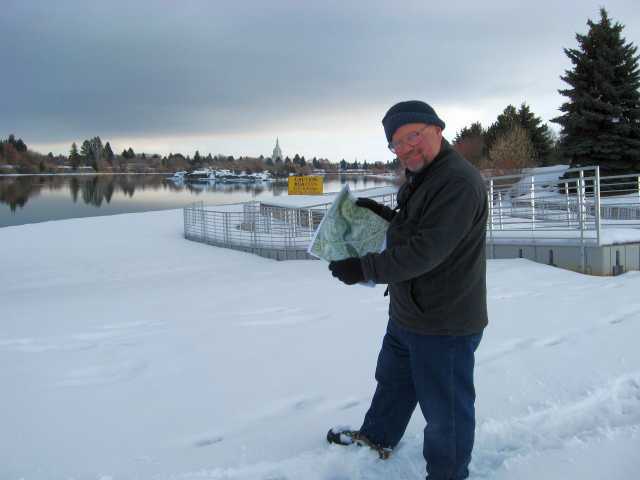 The second accomplishment was working with Dear Friend Terry Miller to create a pocket map to the Greenbelt. This little map has quite a backstory of its own. As usual, the story is far too long to recount here in this blog post. Suffice to say, Terry and I had to overcome a lot of misplaced opposition and skepticism to bring this little gem into reality. The little map lives on and the city's Visitor Center Staff says the free map is one of the most popular items they have in stock to give to tourists. Terry and I will always have fond memories of this project. THANKS, Terry! When I applied for the P&R Commission position six years ago, I told the Director, Dave C. that I wanted to bring a new awareness about and focus on the volunteers who help make P&R tick. 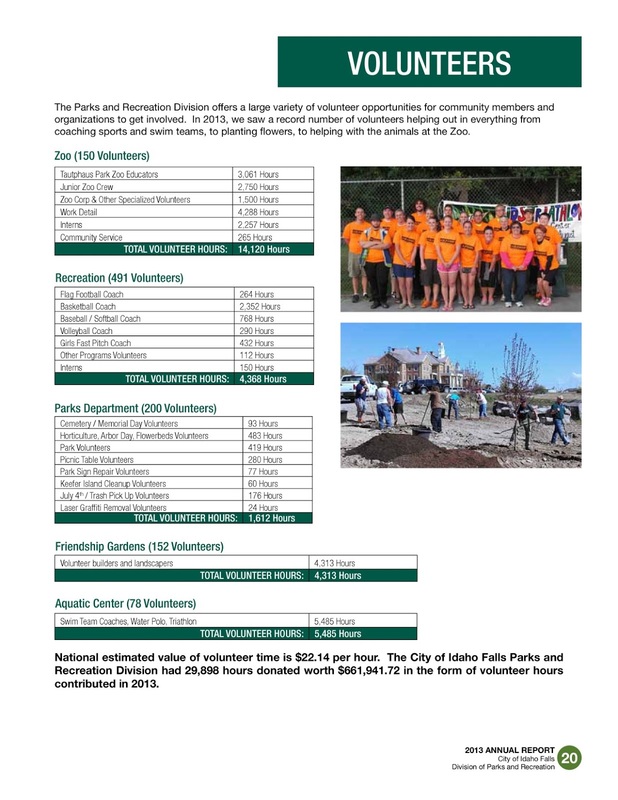 It took quite some time, but we were finally able to get an accounting of the contribution of Volunteers into P&R's annual report. The above ledger of a year's worth of volunteer efforts may not look like much--just another report--but it was a very big accomplishment for us to bring this information out into public view. Hopefully, P&R will continue to produce this point of pride annually forever. And, hopefully, the Division's awareness of the value of volunteers will cause the Division to treat them well and to recruit ever more of those willing to give their selfless service on behalf of our City. Some would not call this an accomplishment since my efforts on behalf of the City's geese ended in failure. All the geese were exported to a unknown goose gulag and City officials continue to goosestep in unison to keep goose grease off the Greenbelt's asphalt walking paths. 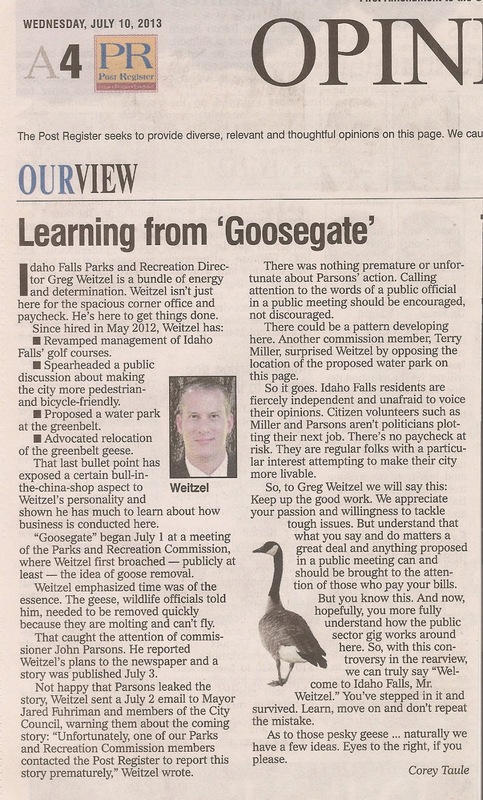 However, I will forever beam with pride and self-esteem for speaking up on behalf of the geese. Speaking up made me Public Enemy #1 in the eyes of Heir Director and I was publicly excoriated by my fellow Parks & recreation Commission members. (Except for Terry, of course.) If I had it to do all over again, I would "stand and deliver" once again just the way I did then. NO doubt about it! I did it for my Mom and it still brings a lump to my throat. 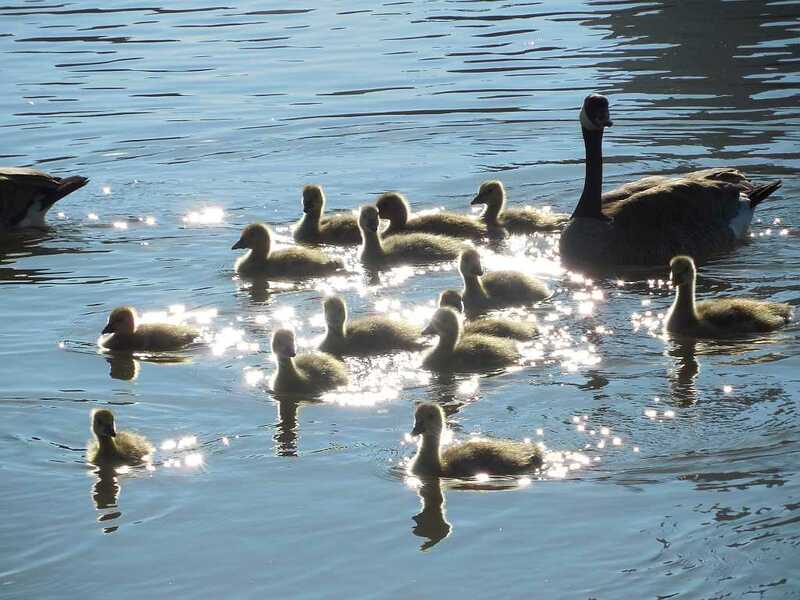 You can read about my Mom and "her geese" in the link below. I love you, Mom! My Mom would have turned over in her grave if I had not stood up for The Geese. After the 2013 Parks & Recreation Commission meeting where I was totally trashed by the Commissioners, I decided there was no way I would "re-up" for a third term. However, I'm not a quitter. Even though I have had nothing but contempt and disgust for my fellow Commissioners and P & R Staff since then (Except for Terry, of course.) I decided to stick it out and serve my full second term. Although I would have dearly loved never to set foot into another meeting of that comtemptable group of petty people, I believe in fulfilling the terms and conditions of any agreement. In my mind, a three-year appointment to the Commission was an agreement on my part that I would serve my term. Well, we did so and I think we finished with a flourish. 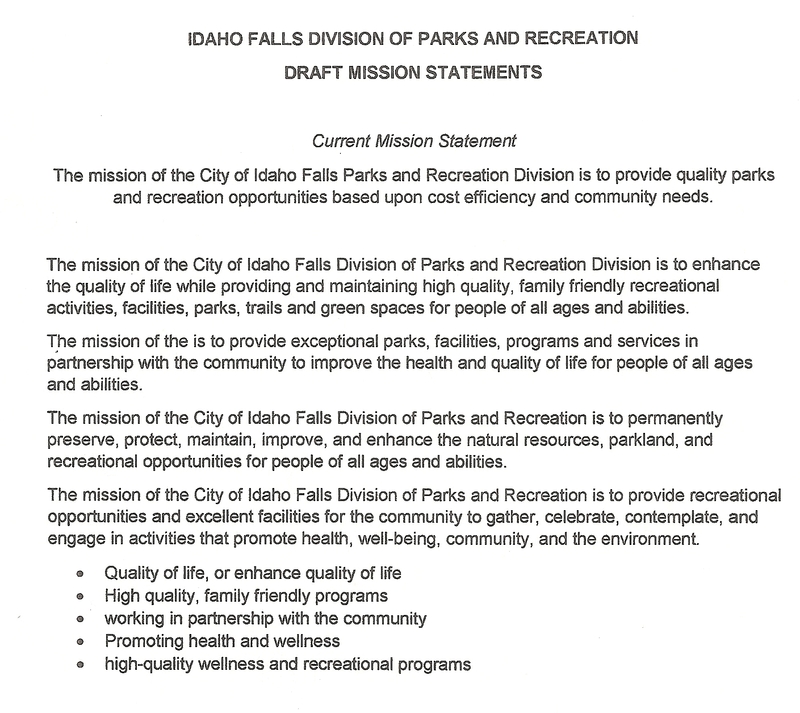 The Parks & Recreation Division has always had a truly lame Mission Statement. As our second term of service neared its end, we decided to take on this lame Mission Statement. We were able to get it on the September agenda. 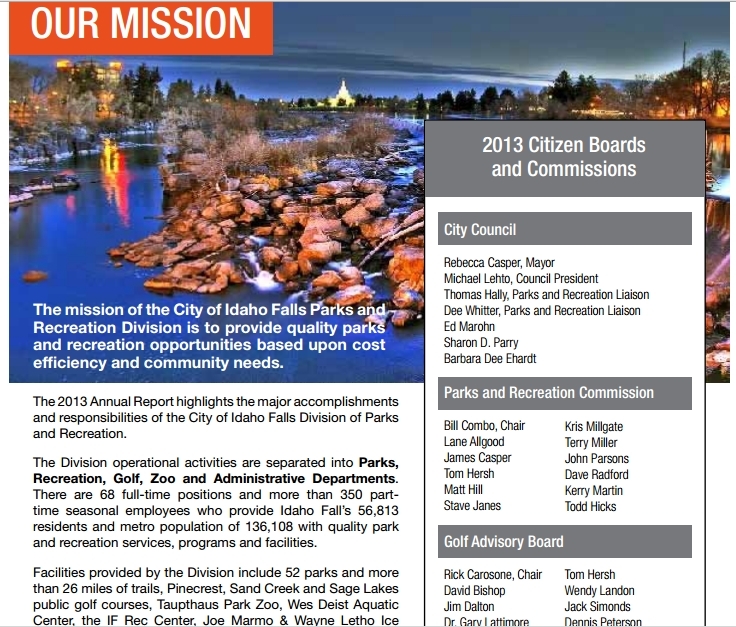 We put together a report showing how vibrant a Parks & Recreation Mission Statement can be. We were delighted that our fellow Commissions actually agreed (although we could see it pained them to do so). Meanwhile the Director was assigned to come up with a new and improved Mission Statement. What you see above are the draft statements he and his core Staff developed and presented at the October 6th meeting. We don't know which one will finally be adopted but the train has left the station and we're certain a nice, new, shiny Mission Statement will soon be appearing. It was a final Point Of Pride in our six years of service. Glad we served those six years! And danged glad it's over! JP, thanks for your dedication and commitment...proud of YOU. You always leave a campsite better than you find it, John. I like your "half full" glass view, too. Thank you for giving greatly of your knowledge and experience in all of your volunteer enterprises. The world is a better place because of you.